A few weeks ago, I flew to Johannesburg, South Africa to visit my sister. 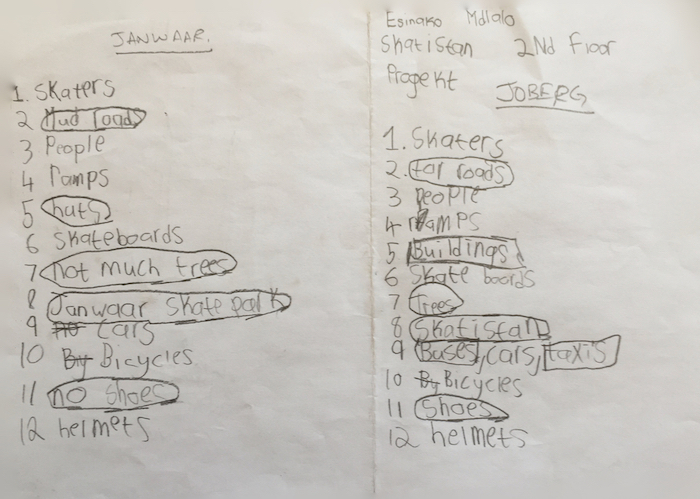 I knew that Skateistan is running a skatepark there – so this was my chance to visit a part of the project which had inspired Ulrike to set up Janwaar Castle. Oliver, the founder of Skateistan, introduced me to Kelly Murray, the program manager in Johannesburg. When I first arrived at the skatepark Kelly gave me a tour. They’ve a beautiful skatepark between a huge apartment building to the left and a ruin covered with graffitis to the right. Their learning spaces are made from shipping containers – it seemed to me like everything had come together piece by piece. During my first visit I couldn’t interact with the kids – they were already engaged in other activities. But together with Kelly, I planned a second visit and we decided that I would conduct a workshop. So far I’ve had seen only our village kids responding to a skatepark and now I was keen to experience how city kids from a township would react. I was surprised how comfortably the kids talked about differences and discriminations. At the beginning of the workshop I introduced myself. 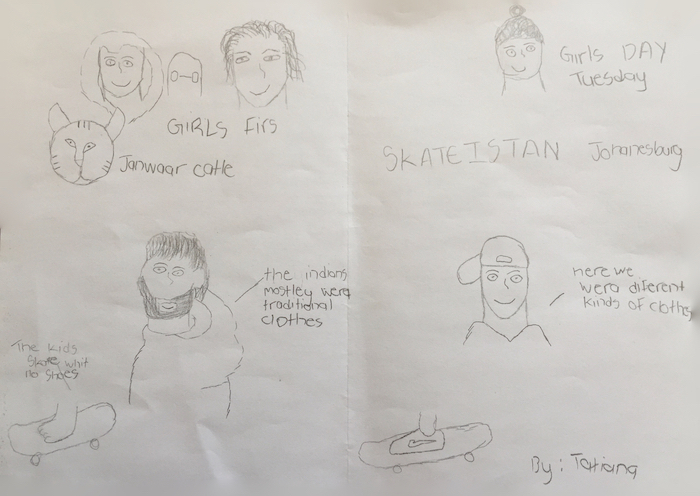 I continued with a brief introduction of Janwaar and showed the 101India video: ” The Barefoot Skateboarders” which went around the world. Within a minute, the kids started exclaiming: “Look, these kids are skateboarding without shoes, pads, and helmets!” It was unimaginable for them not to wear shoes. I explained the reasons why our kids don’t have shoes. And I told them how we got shoes for some of them. 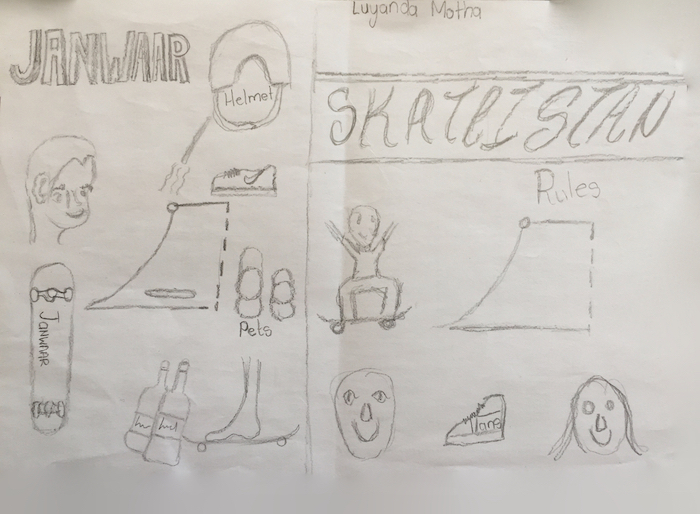 They were stunned when they heard Ramkesh’s story – Ramkesh is one of our best skateboarders, he is only 11 years old and travelled for five weeks to Europe. He once said: “I need to feel the board with my feet. I don’t want shoes!” Only when they slowly realised that shoes will help them to reach the next level in skateboarding, to do higher Olies and other tricks, they started wearing shoes. When the video was over, I asked them what they’d observed: They remembered the two rules “Girls First” and “No school, no skateboarding” and how a father stopped drinking and instead came to see his son skateboarding. The next videos we were watching were the Decathlon videos of our First Janwaar Castle Skateboarding Challenge and the one of the Europe Tour. Now they saw our kids wearing shoes while practising the next level tricks. They even asked me to replay some of tricks. The Joburg crowd was pretty excited to watch the competition video and they asked me about the next challenge and if they could participate. How lovely would that be? 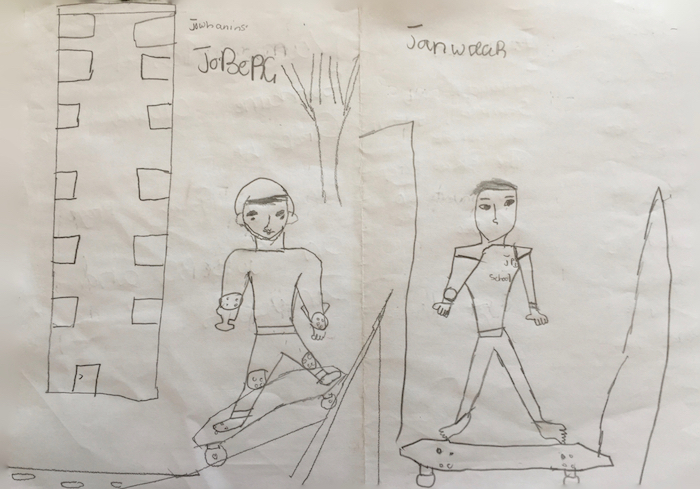 The Skateistan kids from Joburg traveling all the way to Janwaar! After our video session I distributed paper and asked the kids to split a sheet into two. 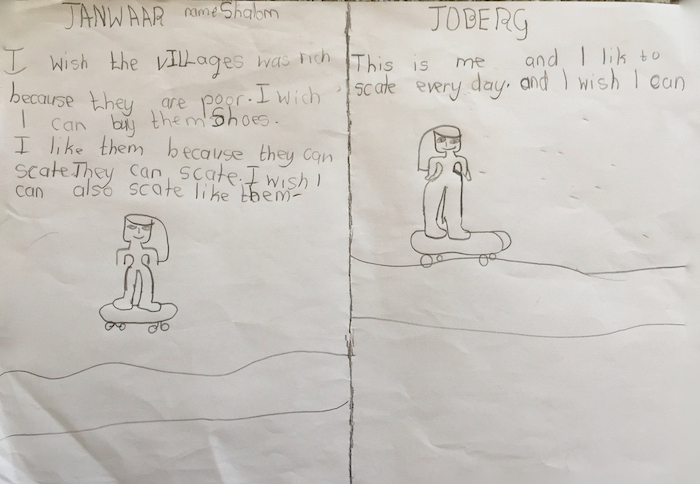 On one side they should draw something about Janwaar and on the other side something they cherish about Skateistan Joburg. Janwaar: No shoes, no safety gear. Joburg: With shoes and safety gear. “Girls First!” in Janwaar. “Girls Day Tuesday” in Joburg. Cows, rocks, and plains in Janwaar. High rise buildings in Joburg. Singers in the skatepark – “Nothing Impossible”, the Janwaar Castle song. The problem of alcoholism in Janwaar. Poverty in Janwaar, due to which they cannot afford shoes. Traditional clothing in Janwaar. Modern clothing in Joburg. Ever since I had heard about Skateistan I wanted to visit the place. It was the Skateistan story which led me to Janwaar in the first place. Now, being here with the Skateistan kids in Johannesburg, was an incredible experience. It would be far beyond awesome if they would pack their bags and meet the Janwaar kids some day! Hopefully soon.